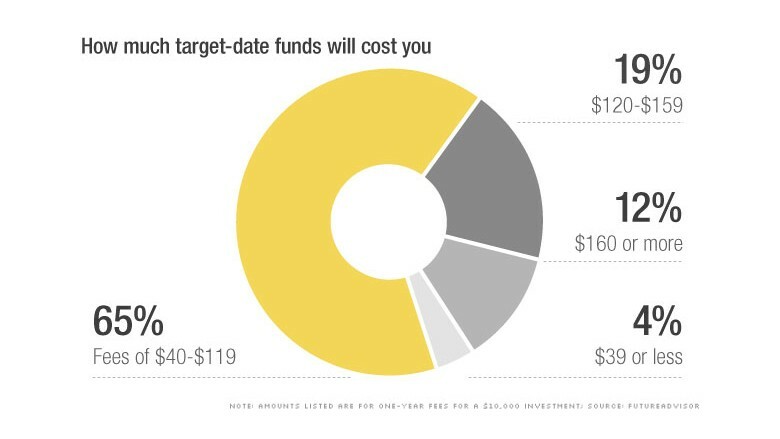 Is your target-date fund ripping you off? Target-date funds have become a wildly popular option among those seeking a hands-off approach to retirement investing. But not all of these funds are created equal. Based on the year you expect to retire, target-date funds are supposed to invest in a mix of stocks, bonds and cash that reflect an age appropriate level of risk that changes as you get older. Yet, annual returns can vary dramatically -- even for investors of identical ages -- and some funds can carry sky-high fees, according to an analysis of more than 1,700 target-date funds conducted by online financial advisor FutureAdvisor. "Just because it's called a target-date fund definitely doesn't mean it's the same thing across providers," said Janet Yang, director of multi-asset class strategies at Morningstar. 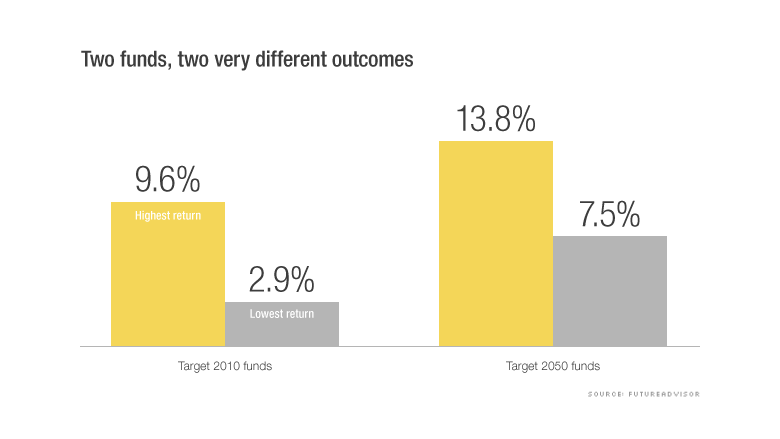 Consider the highest and lowest 5-year average annual returns for retiree investors (Target 2010 funds) and investors in their late 20s (Target 2050 funds). 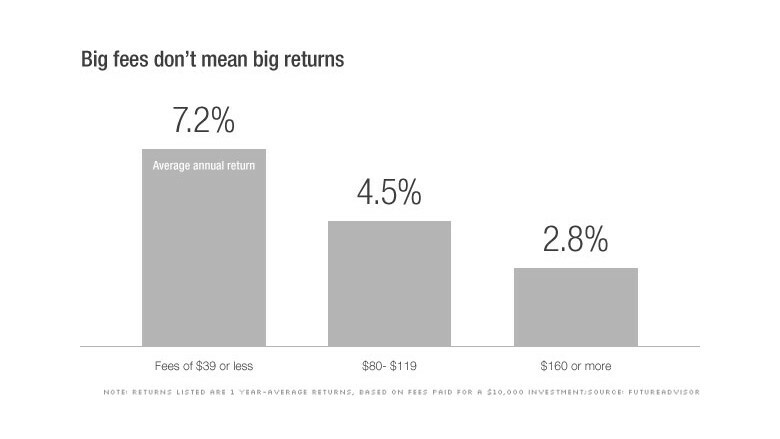 The chart below shows just how much the returns vary, often because of fees and competing investment approaches. Related: Are you making this retirement mistake? For savers in the Target 2010 funds, for example, a return of less than 3% likely won't be enough to help retirees keep up with inflation, while a return of nearly 10% could indicate investments that might be too risky. Meanwhile, the younger investors in the Target 2050 funds are decades away from retirement and should be in funds with returns that are on the higher end of the range. FutureAdvisor also found that, on average, funds that charged higher fees had significantly lower annual returns than their cheaper alternatives. Take this example of one-year average returns for low-, middle- and high-cost funds in 2014 for workers nearing retirement this year. Those who paid the lowest fees ($39 or less a year for every $10,000 invested) had the highest annual returns on average, while those who paid the highest fees ($160 or more) saw average returns of just 2.8%, FutureAdvisor found. Of course, lower returns aren't always a bad thing, especially for older investors. Those lower yields can also mean that your money is invested in less risky assets, which protects your savings from steep losses should the market take a turn for the worse. So how can you find the best target-date fund for you? Make sure the timing is right: If you've been automatically enrolled in a target-date fund through your employer, double check that it fits with your retirement time frame. Default investments are based on your age so if you plan to retire before or after the age of 65, you might want to shift to a different fund. Find the right mix: Learn how much of the fund is invested in stocks, bonds and other investments and how that mix will change over time. You should be able to find this information through your 401(k) provider or on the fund provider's website. Then, take our risk tolerance quiz to see if that mix makes sense for your situation. Calculator: Are you on track for retirement? Some funds, for instance, stop changing the investment mix once you reach your target retirement year, while others continue to change the mix into your retirement years. "You really need to get under the hood of these things and figure out what's appropriate for you," said Todd Douds, director of research and operations at Pittsburgh-based Fort Pitt Capital Group. Keep an eye on fees: Among all the funds it analyzed, FutureAdvisor found an average expense ratio of 1.02%, or around $102 a year, for a $10,000 investment. A small fraction of the funds had fees as low as $39 a year for a $10,000 investment, while hundreds more had fees below $100. End up in one of the priciest funds, and you'll pay $160 or more each year. Even a relatively small difference in fees can add up to tens of thousands of dollars in lost returns over decades of saving. "There aren't many things an investor can control, but fees are one of them," Yang said. Index-based funds, which mirror overall market movements, tend to be cheaper than actively managed funds. But there are still overpriced funds in both categories so do your research. Correction: An earlier version of this article misstated the investment amount that fees were based on. The fees were calculated based on a $10,000 investment. 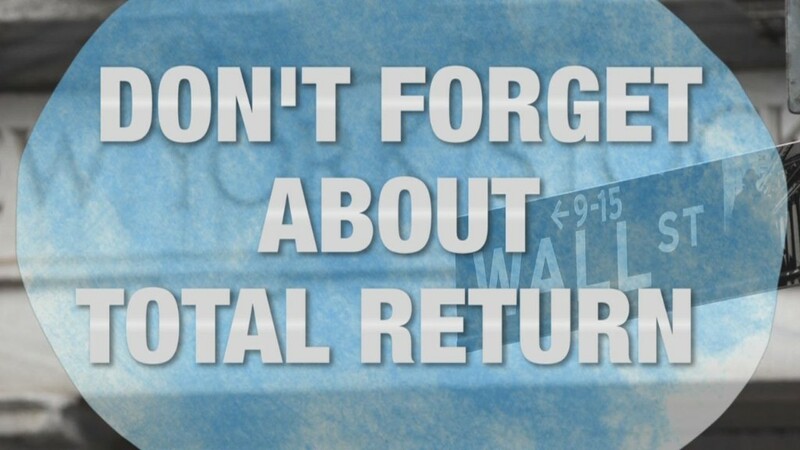 All returns and fees based on data ending Oct. 31, 2014. Five year-returns were based on a subset of almost 1,200 funds that were available for the entire 5-year period.